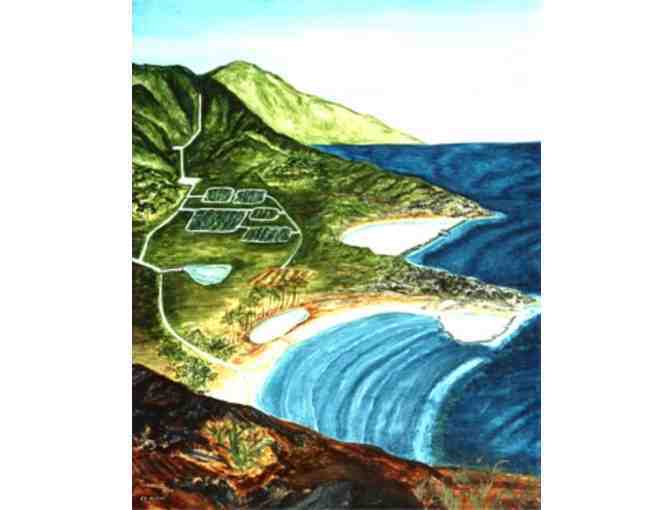 The ahupua'a is an ancient mountain to sea management system. Fishponds were developed along the watercourse and into the ocean. This ahupua'a depicts four basic fishponds and one fish trap. To learn more about Carol and her artistic process visit her bio page here. All fishponds have a complex ecosystem. These are just a few of the fish grown in Lokoea. We ate heartily of all the fish, crab, and shrimp, except for 'o'opu, which are sacred to Volcano goddess Pele. Your support matters, so VOLCANO ART CENTER would like to use your information to keep in touch about things that may matter to you. If you choose to hear from VOLCANO ART CENTER, we may contact you in the future about our ongoing efforts. Copyright © 2003-2019 VOLCANO ART CENTER and BiddingForGood, Inc. All Rights Reserved. Designated trademarks and brands are the property of their respective owners.